In Down a Sunny Dirt Road: an Autobiography, Random House, 2002, Stan and Jan Berenstain describe an early professional breakthrough. 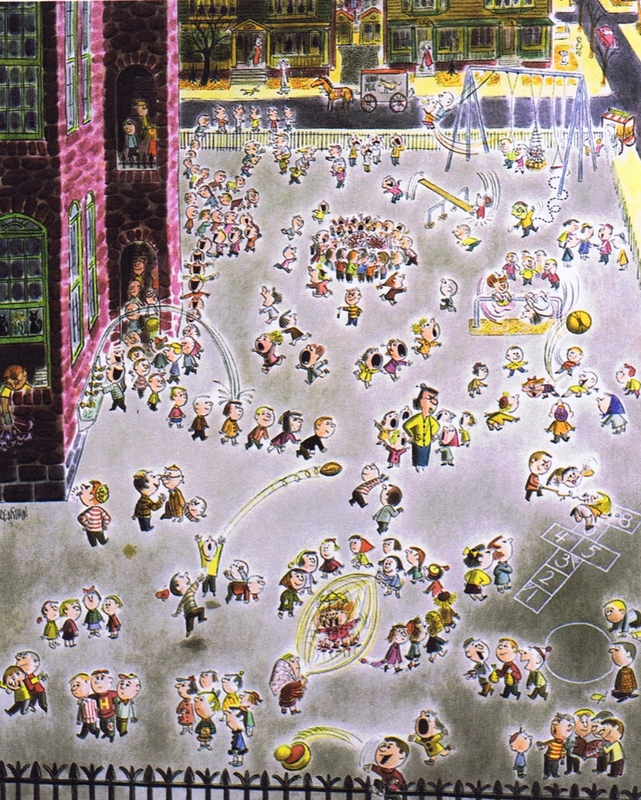 Recess: the Berenstains’ first full-page, full-color cartoon in Collier’s, 1948. It recalls the many forms of play and mischief they participated in during their days in Philadelphia-area elementary schools and contains no fewer than 209 (count ‘em) figures, all but eight of them depicting children at play. Moreover, Williams wanted more. He urged them to create a sequel, immediately. This became Freeze ― a winter version of children at play: skating, hockey, sledding, skiing, snowball fights―you name it, it’s in there. Freeze was followed by Gymnasium, which was followed by Saturday Matinee. For many it summed up a whole era of popular culture and one that was soon to disappear―the world of that afternoon-long, multilayered entertainment extravaganza, the Saturday matinee. Stan and Jan again produced a crowd scene of tots on the rampage. They drop things off the balcony, they take good aim with pea-shooters and squirt guns, they blow bubbles, climb on seat backs, play the kazoo, drip ice cream and, in the left foreground engage in something resembling major combat. There are a few oases of peace in the theater, as well. 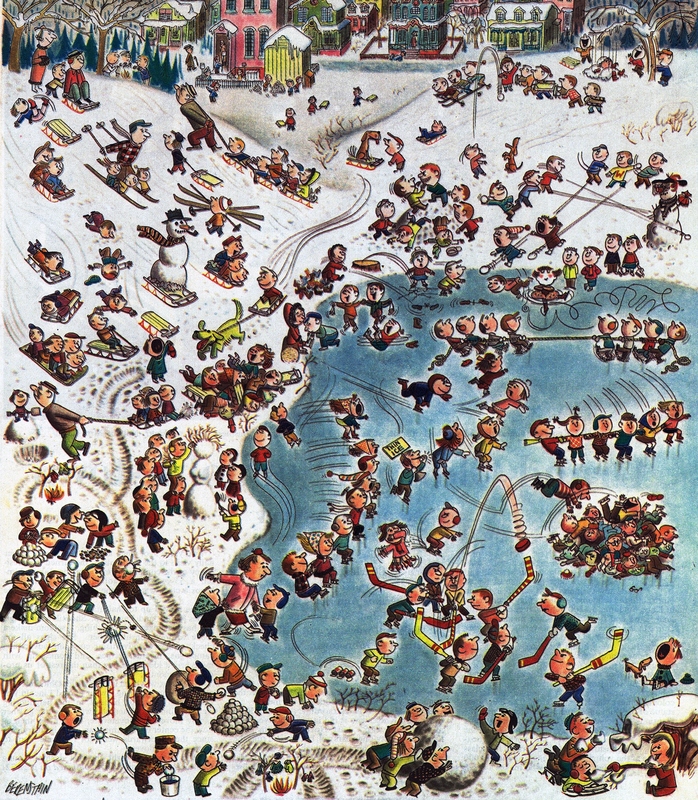 One with a personal connection is the little boy in the front row, right, standing on his seat calmly sucking a lollipop while observing the chaos around him. This is a portrait of their son, Leo, who had just turned one. 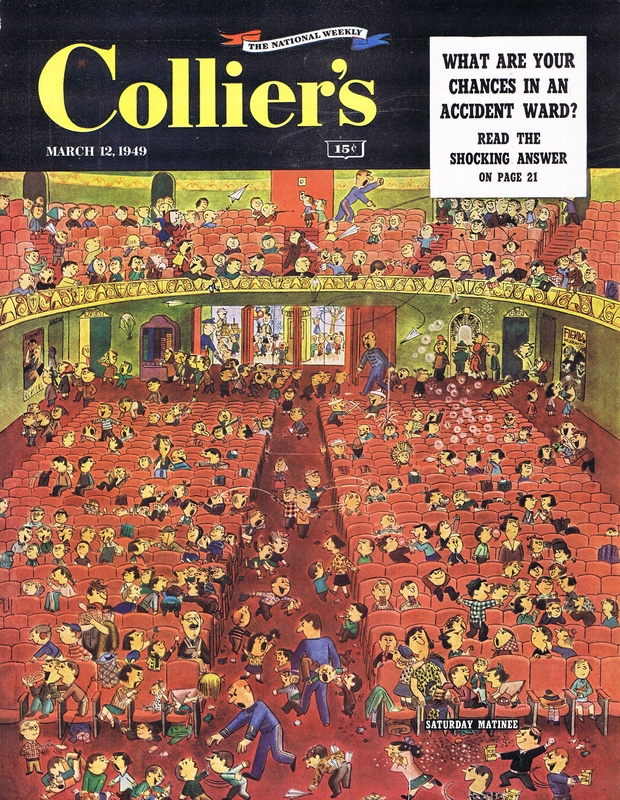 Saturday Matinee, Collier’s, March 12, 1949. 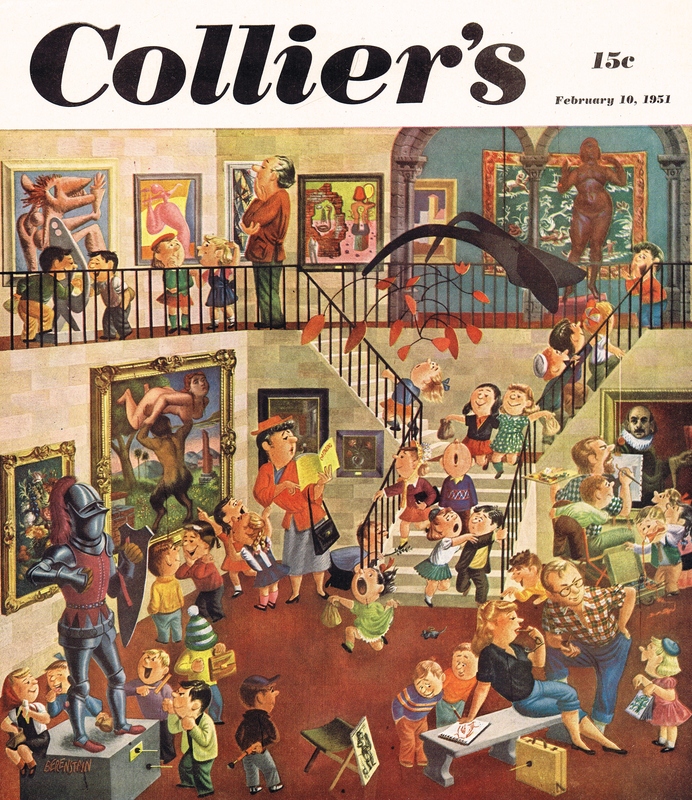 Over the next two years, Stan and Jan produced ten Collier’s covers and one more interior full page. One of them, Art Museum, was exhibited at the Metropolitan Museum of Art as part of a world exhibition of cartoon art. The scene and collection depicted in Art Museum is an amalgam of the Philadelphia Museum of Art and New York’s Metropolitan Museum of Art, two of Stan and Jan’s favorite places. The scene approximates the grand hall of the Philadelphia Museum with its large Calder mobile. The Lachaise sculpture is in the Met collection, as are other depicted works. Velázquez’s Court Jester with Glass of Wine is in neither collection, nor is the portrait of Gurney Williams, Collier’s humor editor, which they incorporated into the painting. 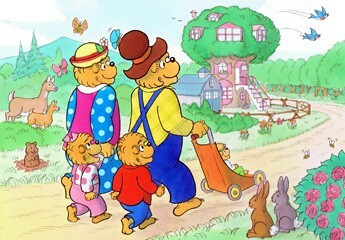 If you missed Part 1 of Team Berenstain, you can read it here.